Like many overcrowded, bursting cities in developing countries around the world, China’s capital Beijing has a notorious smog problem that has only worsened in recent years as the numbers of people, smokestacks and vehicles have all surged, resulting in a staggering increase in emissions of air pollutants. The two young Canadian businessmen had been selling so-called Vitality Air for just over a year, but in early December their sales to China jumped, according to The People's Daily Online. The red alert lasted three days, and was actually the second attack of toxic air in December alone. During this time the levels of tiny hazardous airborne particles known as PM 2.5 (particulate matter smaller than 2.5 microns in diameter) spiked at more than 900 micrograms per cubic meter, a level extremely hazardous to health. Lam and Paquette cofounded Vitality Air in 2014. They compress fresh mountain air from beautiful Banff and Lake Louise in the lofty, lovely Canadian Rockies into large cans. (The environmental regulator in me can’t help but ask: Should they be able to harvest and profit from that vital public resource free of charge and without permit?) Then they set up a marketing website and listed Vitality Air on Taobao – a Chinese website similar to eBay for online shopping – and very quickly sold out of their product. Screen shot of Vitality Air’s website. One of the Vitality Air products for sale. I have been to beautiful Banff and Lake Louise: both are in Alberta’s spectacular Banff National Park in the Canadian Rocky Mountains. I have never been to Beijing, and, given its abysmal air quality, I have no intention of ever going there and exposing my lungs to its toxins. Lovely Lake Louise is perched high in the Canadian Rockies of Alberta; the amazing cobalt blue color of its water is due to suspended and dissolved minerals in runoff from glaciers. Same scene in Beijing with good and bad air quality. An all-too common sight in polluted Beijing these days. 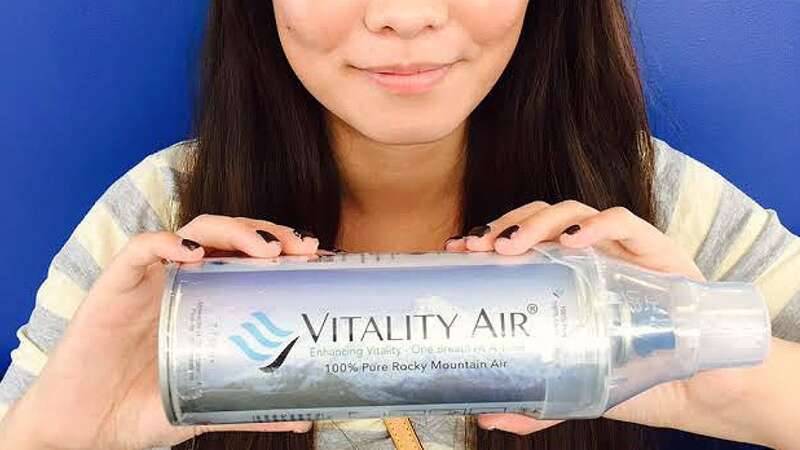 Vitality Air sells one canister of compressed air for up to U.S. $46, depending on the size. That’s around 300 yuan to Chinese residents per can of air, or 150 times the price of a bottle of mineral water – usually around 2 yuan. The company has also had sales in other countries, including Iran and Afghanistan. Selling “fresh air” in a bag or a bottle is not a brand new idea in modern smog-smitten China. Both home-grown and foreign entrepreneurs have tried to capitalize on the country’s worsening air pollution for some time. In 2014 China planned to offer bottles of “oxygen” to tourists affected by smog, as part of a tourism scheme by authorities in China’s southwestern Guizhou Province. In 2013 another Chinese businessman hit the jackpot when he sold cans of air the size of soda pop for 80 cents apiece. Chen Guangbiao told reporters he sold 10 million cans in 10 days. When the recent red alert was issued in Beijing, the authorities announced plans to close schools, temporarily shut factories and prohibit half of the city’s cars from operating. 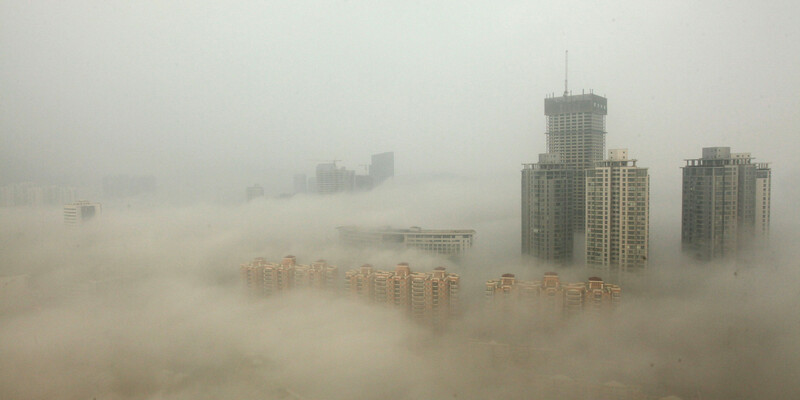 The World Health Organization (WHO) describes China’s hazardous air pollution levels as an environmental crisis. The U.S. Embassy in Beijing also has an air quality monitor to measure PM 2.5 particulates as an indication of the air quality on the embassy grounds located in the Chaoyang district. Making millions of cyber-citizens acutely aware, in real time, of just how unhealthy their air is has helped shame and pressure authorities (who would rather ignore the problem) into doing something about it – or at least trying to. But it’s an uphill battle. Controlling pollution is costly, and in poor countries struggling to increase output and income, it’s often considered a luxury they can’t afford – even when health or life itself is at stake. The more overpopulated a city or a country is – and China and India, the two most populous nations on Earth, are the two most glaring examples – the more imposing or insuperable the challenge is, because the more people and polluters there are crammed into a given airshed. Regulators understandably don’t want to “kill the goose that laid the golden egg,” by imposing controls that are so costly or onerous that producers and consumers are forced to cease and desist. Bottled air is not a comprehensive solution to air pollution, any more than bottled water is a solution to water pollution. The appearance of businesses like these is rather a symptom of the severity of the problem. After all, what’s a hapless air breather (that is, each and every one of us) to do when government and industry have proved incapable of solving the air pollution problem? You can’t blame people for fending for themselves first and foremost – even though it is doubtful that canned air even renders any measurable health benefits to those who can afford it. 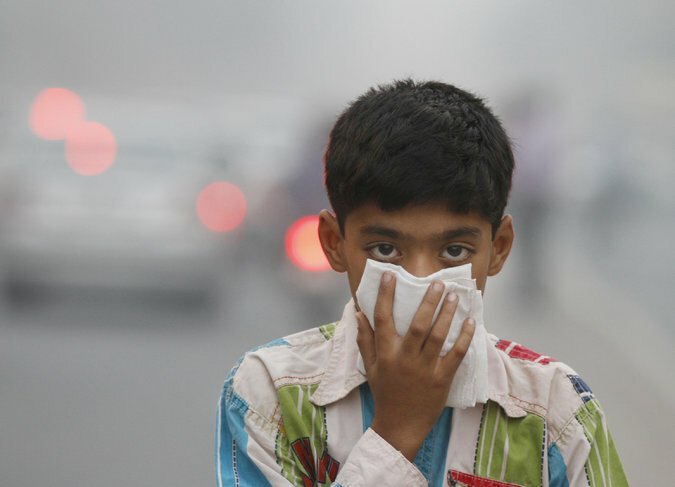 Indian youth peers toward an uncertain future because of poisonous fumes he is forced to breath. The populous, polluted cities of developed countries like the United States and Great Britain passed through this hyper-pollution phase earlier in the 20th century, but not before “killer fogs” took a terrible toll on public health. 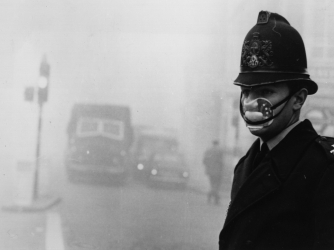 For five days during a cold snap in December 1952, residents of London literally gasped for breath as a toxic fog, dubbed the Great Smog, enveloped the capital of Britain. Due to the cold, millions of residents stoked their coal fireplaces, pouring soot into the sickly skies along with hundreds of industrial smokestacks. The Great Smog paralyzed the city and blacked out the sun, ultimately claiming the lives of some 4,000 to 12,000 Londoners, according to various estimates. London’s Great Smog of 1952. Authorities in London responded by transitioning the city away from coal as the city’s primary heating source, replacing it with gas, oil and electricity. But this transition took decades and thousands of more premature deaths. Contraceptives, family planning and reduced birth rates also ensured that London’s unsustainable population growth rate slowed down. In spite of its draconian birth control policies, China’s population continues to grow (though at a slowing rate), while India, with a much higher birth rate, continues to grow even faster than China (1.5% vs. 0.5% annually, or about 19 million vs. 7 million people added annually). In India, a population more than three times greater than the population of the U.S. is stuffed into an area only one-third the size; in other words, India has a population density approximately 10 times that of America’s. Sadly, what this implies for India is that as its population of 1.3 billion continues to grow, eventually surpassing China’s, and if its economy continues to develop and produce and consume ever more, its air pollution will only worsen before it gets better, IF it gets better. The upshot is that in addition to requiring a variety of technical air pollution controls (e.g., catalytic converters on cars, scrubbers on coal-fired power plants, solar and wind energy instead of coal), India needs to rededicate itself to the mission of population stabilization ASAP by continuing to expand reproductive health services and educational and employment opportunities for girls and women. 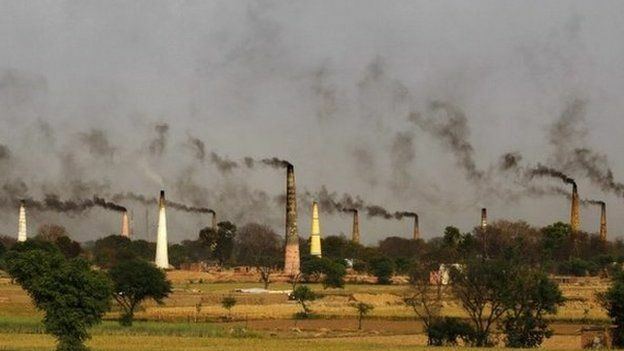 Smokestacks pour filth into India’s besieged skies.